Science history is always entertaining and enlightening; if for no other reason than to remind us that what happens behind the scenes is as important as what is on stage (so to speak). …I’ve outlived my blood many times over. [It] is still a disquieting notion that my blood retains none of its original parts. 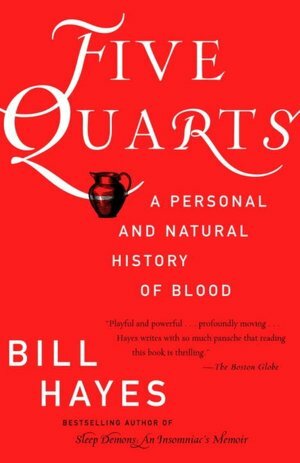 As the title states, this is both a history of blood (discoveries, cultural impacts, changes in perceptions, etc.) and Hayes’ personal journey with it via his relationship with his HIV+ partner. All this intermingles, generally in a linear timeline, reminding the reader that today’s understanding of blood was not a foregone conclusion. You are taken on a journey from ancient Greece and the humors of the body to our modern day blood diseases like HIV and hemophilia with tangents along the way explaining how and when key discoveries were made. I have to admit, the sections on Ehrlich, the father of hematology, histology, immunology, experimental oncology, and the pioneer in chemotherapy and cytochemistry, were my favorite. It was a tangible reminder of the effort required to discover the simplicity within great complexity; the interrelatedness of the entire system as nothing is an island in the body. Definitely recommend this to anyone describing themselves as a science geek.